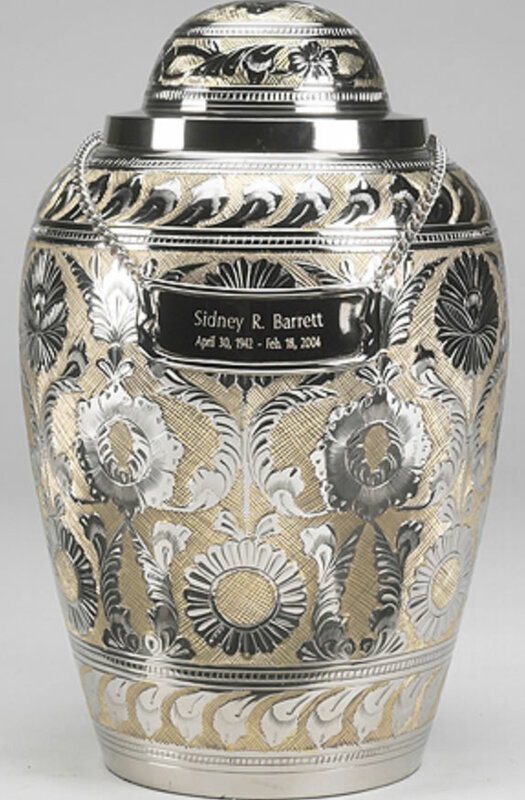 The Dynasty SilverGold Cremation Urn is a solid brass urn with a hand-etched design over the entire urn. It has a threaded lid for easy loading and a secure closure. The felt base will protect furnishings. The urn is presented in a velvet case which can be used for storage or transportation. An optional Large Bright Silver Medallion Name Plate on a chain can be purchased to personalize your urn. Please limit engraving to no more than 26 spaces for the name and no more than 33 spaces for the birth/passing dates or a very short sentiment. 10.75" high and holds 228 Cubic Inches which is large enough for most adults with healthy weights less than 225 pounds.